So the little sister is turning ONE tomorrow! Oh my gosh, can you feel my excitement? Although we are not holding a big party where we invite all the friends and relatives, it will no doubt be a cosy party with the immediate family members and people who love her most. Anyway, what's a birthday without a theme? Truth is, with no theme, it's very hard for the party-planner-wanna-be-mum to do up the decoration, games and party favours. So, for Ariel's first birthday, think the ocean and Little Mermaid. Yes, we are going UNDER THE SEA! In the last of my Creativity 521 series for this year, I am sharing with you the party favours we made for the party which I am hoping will delight the kids - Snow globe aquariums. 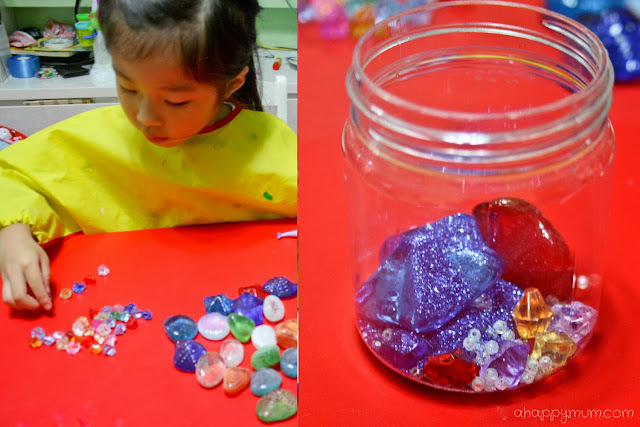 Firstly, we did Ariel's aquarium and the big sister was in charge of choosing all the coloured pebbles and stones and then putting them into the jar for her beloved little sister. Of course, with babies, it is not advisable to use glass jars for safety reasons but because I didn't want her to miss out on the fun, I used the smaller plastic jar instead. Once you have put in the desired pebbles and stones, choose a sea animal for your jar and put that in. Then, add in some glitter, beads and a few drops of glycerin, which will make the glitter flow more slowly. For the big kids' aquariums, we added in a decorative plant to give it a more realistic look. I used a sealant to secure it to the jar lid or you can also use a strong super glue to do the job. Next comes the fun part! Angel was thrilled to choose all the animals, stones and pebbles for herself and each of her cousins and she put them into the jars one by one. Other than the glitter which I had to help out since it would cause quite a mess, she did all the rest herself, including adding the beads and glycerin. What amazed me most was that she told me "Mummy, I can scoop all the water into the jars on my own." Even though it was already 10:30pm and I knew I could do it much faster, I decided to let her have a go and she was so meticulous at it that she did an awesome job filling up all the jars. Well well, she never fails to surprise me, does she? I wanted just a light blue colour for the water so it only required one drop of food colouring. You can add more water to dilute it and make it even lighter. If you use water that is too dark, you will not be able to see the inside clearly which kind of defeats the purpose, don't you think so? Make sure the water is filled to the brim to prevent excessive air bubbles, then secure the lids by using hot glue or a multi-purpose sealant. I like the sealant because it works on wet surfaces and it helps to keep out the water effectively. Which means, we can turn the jars and let them stand upside down which makes them resemble aquariums so much more! There! What do you think of these imaginary aquariums as party favours? I did think of giving away real fish in tanks but since that would mean I need to get the pumps and filters in place, I guess we can all use some imagination this time round. Lastly, I personalised the aquariums by writing on the names with a paint marker and tied ribbons around them. Yippee! I guess we are all set for the party! For more kids crafts, party ideas and DIY tutorials, visit my gallery here. P.S. : We will be away during the Christmas week because we are going on a c-r-u-i-s-e! Hooray! Time for some family bonding so pardon me for missing in action on the blog next week! See you very soon and have a fabulous holiday with your loved ones too! Merry Christmas and Happy New Year, everybody! Wow, love this idea. And you've really got a good helper. Thanks Susan! Haha yeah, she's not bad at all! =) Glad it makes her happy! Great and simple craft I can do with my 2 boys! Enjoy your cruise trip! Yes yes, I hope they will enjoy making these! Thanks so much! =) Merry Christmas! Oh that's a smart idea! We will try that too! Thanks, I am just glad the kids loved the party!